I didn’t really notice that these were missing until I read this code commit and tried some of these apps or actions. 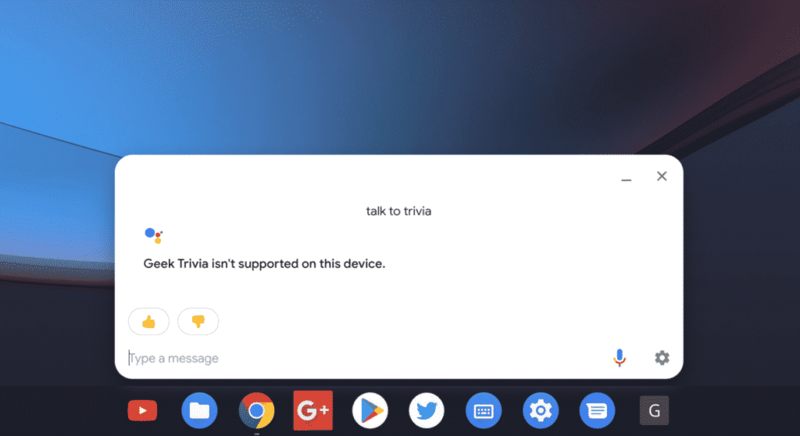 Google Assistant on Chrome OS does not support Apps, yet. I haven’t seen any official documentation on what is classified as “Apps” but I am assuming that they are voice commands that you start with “talk to”. For example, by saying “talk to Trivia” you are launching the Trivia app for Assistant. Assuming that all those assumptions are correct, apps support seems to be coming to Chrome OS. First, I had to figure out what these apps are. I initially thought it is the Assistant Android, that did have some issues. I could not get it to work. Then I tried these “apps” on Assistant and none of them worked. I tried this on my phone, to make sure that this is not a geographic limitation, and I could play this game. So, I am 95% sure that the “apps” that they are talking about is this.I am hoping to see this flag in action in one of the upcoming Canary channel updates. I will post an update when the flag is available. PS: If you think this is the flag for a different feature, let me know in comments!